This week's EtsyInspired shop is Bacon Square Farm. The adorable Pete and Tanya (who I've gotten the pleasure of knowing over Etsy chat) run this BEAUTIFUL shop. They make their creations in a transformed cattle barn and pig feeding station. How cool is that? The shop is full of beautiful pieces of furniture, sculptures, bird houses and feeders, pet feeders, metal artwork, and more decor items for your home and garden. There's a ton of different pieces in this shop everything from shabby chic to industrial. And I adore it all even though I'm pretty middle of the road when it comes to home decor. The metal work is refined and pristine with clean lines. While the bird houses are more distressed, colorful, and quaint. I do have to say, the birdhouses and garden decor are my favorite. The color combos are so spot on, charming yet not too bold to be outdoors. I wish my backyard looked like one of the pictures in this shop! This week, the adorable Kristen from our DT has a giveaway for you. Isn't she a sweetie? She'll be giving away a wood slide Unity stamp. :) All you have to do to win is pick any item in the Bacon Square Farm shop to be inspired by and make any creation your little heart desires. Post a link to your creation right here on this blog post by next Friday June 5th at noon Pacific time to be entered in a random drawing to win the prize. If you upload to SCS or PCP, please use keyword EIC38 so we can find everyone's creations together. Now, go be EtsyInspired! This is my card for the week. 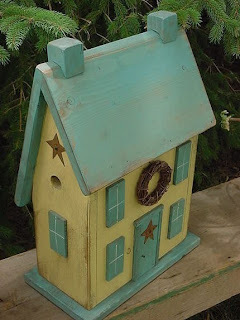 I was inspired by the Rustic Shabby French Cottage Yellow and Pink Birdhouse. I really love the soft colors so I used them as my inspiration. And obviously, I used the little house from Unity's May KOTM. This sketch is also the Monday Mojo sketch from Julee Tilman over at Verve. She donated this sketch to the Stampin Out Alzheimer's site to use as a challenge. Super cute, Ash! Hope you are well! Love your inspiration piece and what it inspired. That soft yellow and cute house look so great together! This is one happy house card. Love the colors and the stamp is just perfect for challenge. 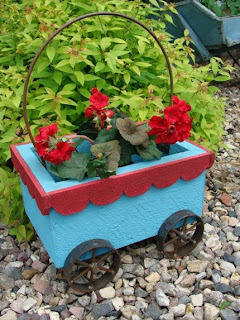 I love the garden pieces the most too :) Your card is so sweet and those colors-beautiful! Have a fun birthday party today! 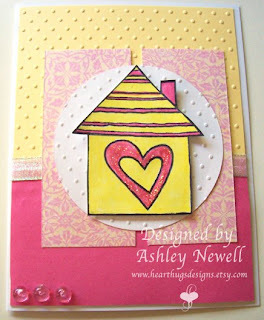 I adore how this card turned out I love the colors and the shimmers and that great house and the texture!!! Totally great card this week!!! This is the perfect little stamp for your inspiration and the colors make for such a sweet and cheerful card! Definitely captured the essence of this shop! Ashley this card is soooo adorable!! :) I love the colors you used! Love it! Ohhh Ashley this is soooo perfect with the swiss dots bg!!!! You and I are a lot alike, aren't we!!!??? I love it!! This is such a cute card Ashley! I love the layout and colors you used...tfs!!! Love your card! I'm partial to yellow, AND to birdhouses! Good job! Thanks the opportunity to play. Here the link to my card.